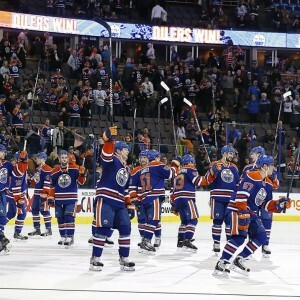 Zack Kassian: Major Piece in Oilers Future? On May 19th, 2016, the Edmonton Oilers announced that they had signed forward Zack Kassian to a one-year contract extension, worth a reported $1.5 Million. A native of Windsor, Ontario, Kassian was acquired by the Oilers from the Montreal Canadiens in December of 2015 in a deal which sent Ben Scrivens to Montreal. Prior, Kassian had spent the majority of his career in Vancouver playing for the Canucks, where he had become known League-wide for his ability to mix offense and grit. For most, signing Kassian to an extension would appear to be nothing other than a move to bolster the Oilers’ depth up-front, which, in all honesty, is exactly what this is at its roots. Loaded with elite young forward talent, Edmonton has long been looking to bolster its bottom-six forward group with players of experience and determination who can compliment their rising stars. However, Kassian retains a unique combination of skills and abilities which could see him play an essential role for the Oilers in 2016-17. Although most will view the Kassian signing as yet another attempt to improve what has long been a sub-par bottom-six, Kassian in fact brings a number of intangible qualities which will make him a surprisingly valuable piece for the Oilers this coming season. Yet, first, lets take a quick look at what Kassian does best. While he doesn’t retain the skill of a Connor McDavid or Taylor Hall, Kassian has been a fairly decent offensive performer throughout his hockey career. 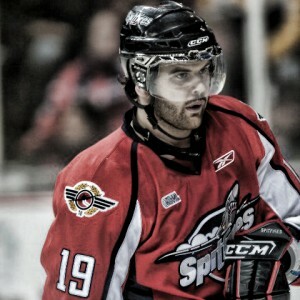 Kassian skating with the Windsor Spitfires. It all began in the OHL, where Kassian played for the Peterborough Petes as well as Windsor Spitfires, the latter alongside Hall. Over his four seasons in the League, Kassian was a point-per-game player, mixing in 24 and 26 goal seasons in the process. Following his junior career and 13th overall selection by the Buffalo Sabres in 2009, Kassian entered the NHL, and other than a few stints in the AHL, has remained ever since, where he has been a fairly decent contributor on the scoresheet. The 2013-14 NHL season saw Kassian record his current career high in goals with 14, as well as in points with 29. Most recently, in his first stint with the Oilers, Kassian notched three goals and eight points over 36 games. Kassian doesn’t have an over-powering shot, explosive speed or elite on-ice vision, but he does have a deceptive release and compete level which allows him to generate offensive opportunities from otherwise quiet plays. If Kassian can do what he has done throughout his career to date with the Oilers this coming season, perhaps netting ten goals and 20 points, he will be a valuable depth contributor for the Oilers. Gritty play is where Kassian has made a name for himself in the NHL, and where he will surely make a name for himself in Edmonton. Over the years, Kassian has racked up penalty minutes wherever he has played, yet they are not always undisciplined minutes, as Kassian tends to collect his minutes in a manner which are overwhelmingly of benefit to his team. Whether it be standing up for a teammate in a fight, drawing a call on an opposing player, or providing his team with a much needed spark, Kassian will do what it takes for his team in order to win a game. The 2013-14 season also saw Kassian record a career high in penalty minutes with 124, however, in just 36 games with the Oilers last season, Kassian sat for 114 in just 36 contests. For Kassian to be successful with the Oilers, he will have to be smart and pick his spots to agitate. He can’t go running around taking undisciplined penalties, especially so considering the Oilers’ current, thin crop of defenders, however, he will need to make it clear to opposing teams that Edmonton’s top players will has a legitimate source of protection on the ice. On top of his offensive skills and gritty style of play, Kassian brings a set of intangible qualities which are where his value truly lies. Perhaps Kassian’s greatest quality is his ability to adapt to different situations on the ice. Given his unique skill set, Kassian will see time on the first line to the fourth, the power play and the penalty kill, and as will such will be required to adapt his game accordingly. Fortunately, Kassian has the ability to do so, as he can contribute offensively when needed, play a strictly checking style of game, or get in lanes to block shots when short-handed. Simply put, Kassian has the ability to play a variety of different positions and roles, making him a truly valuable player. On top of his noted on-ice qualities and abilities is Kassian’s role as a leader. Unafraid to call out a teammate or insist what needs to be done, Kassian is a solid teammate and one who garners the respect of his team through his style of play. A former Captain of the Peterborough Petes at the young age of 18 is an indication of his willingness and desire to lead his team in the right direction, and one a team looking for distinct leaders, the presence of Kassian in Edmonton will surely be a welcome addition. What Role will Kassian Play? So, with all of this being said, at the end of the day, what role will Kassian play with the Oilers in 2016-17? Simply put, Kassian will play a major role with Edmonton, and the quality of season he produces will have a large impact on the success of the Oilers this coming season. In particular, the Oilers will look to Kassian to provide them with a quality level of depth scoring alongside a rough and gritty yet responsible style of play. If the rugged winger can produce 10+ goals, his season will surely be seen as a success, any total much greater would be a bonus for Edmonton. Further, Kassian will need to stay out of the box while playing a defensively responsible, high energy style of game. Edmonton’s young forwards will surely provide a wealth of offense, meaning Kassian simply needs to play a complimentary style in order to remain effective. Further, Kassian’s adaptability and leadership at the young age of 25 will be a welcome addition for the Oilers, especially so over a full season. While the Oilers’ season certainly isn’t dependant on the success or failure of Kassian this coming season, it goes without saying that a strong year from Kassian, alongside his intangible qualities, will surely be of benefit to Edmonton in what will be an incredibly important 2016-17 season.